After a long morning of travel we arrived at our next destination Lake Nakuru. After some quick paperwork at the new gate, since the old one flooded and is now partially under the lake, we sped through the forested side of the park towards the Nakuru Sopa Lodge, our base for exploring this park. The road winded way up the escarpment overlooking the lake, and perched ontop was a beautiful collection of stand-alone bungalows and a huge bar and dining area. We arrived just in time to catch the tail end of lunch. Our rooms, 27, 28, and 29 were far enough away from reception to necessitate a golf cart shuttle service, but we were up for a bit of walking. Everyone was pretty amazed once inside the rooms. The view was gorgeous from on top of the escarpment, there was fine woodwork everywhere, and the bathrooms were ludicrously large...complete with what we assumed was a bidet. It was hard to tear ourselves away from the luxury of our rooms for an afternoon game drive, in fact David decide to stay and soak it all in, but the wildlife called so off we went. It was a pretty auspicious start as it was too rainy to put up the pop-top, but spirits were high, especially since cocktail hour came a little early in the form of some whiskey in a plastic water bottle being passed around. 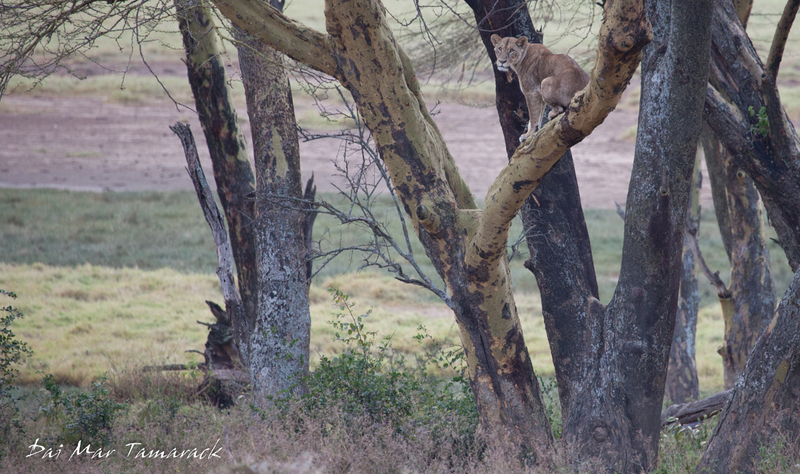 This led to a pretty comical bathroom stop about five minutes into the game drive in less than five star conditions. Luckily the troop of baboons came through about 2 minutes too late to interfer with everyone concentrating on not missing the shot glass side hold in the outhouse floor. 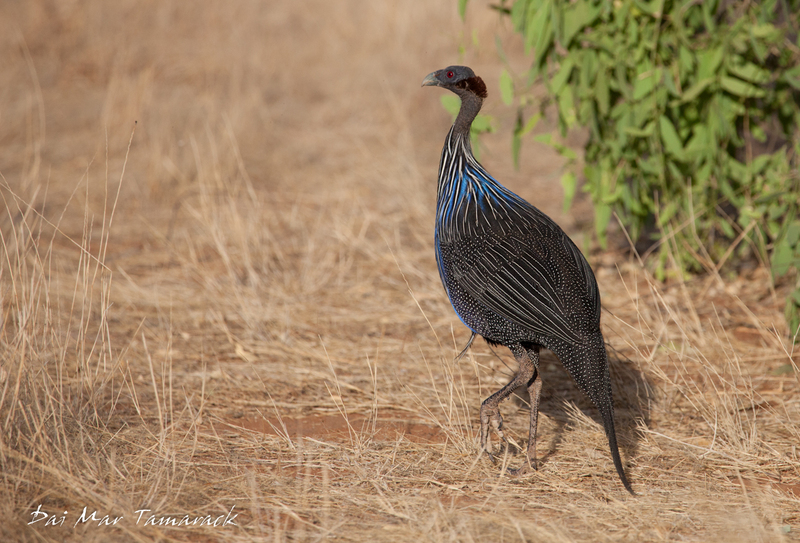 With everyone feeling relieved and the rain stopping, everyone started to notice just how much wildlife was around us. 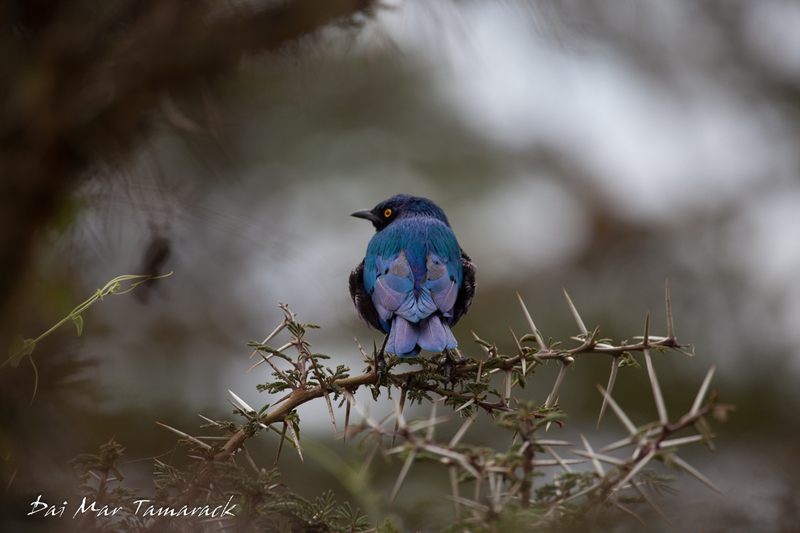 Glossy starlings and Rothschild's giraffes peered out from the yellow fever trees. The curved horns of buffalo stuck up from their resting places in the tall golden grass. Different species of eagles line the tops of the trees, especially out towards the open grasslands here in Nakuru. That is when someone notice a couple of large, light grey rocks out in the middle of the field start to move. 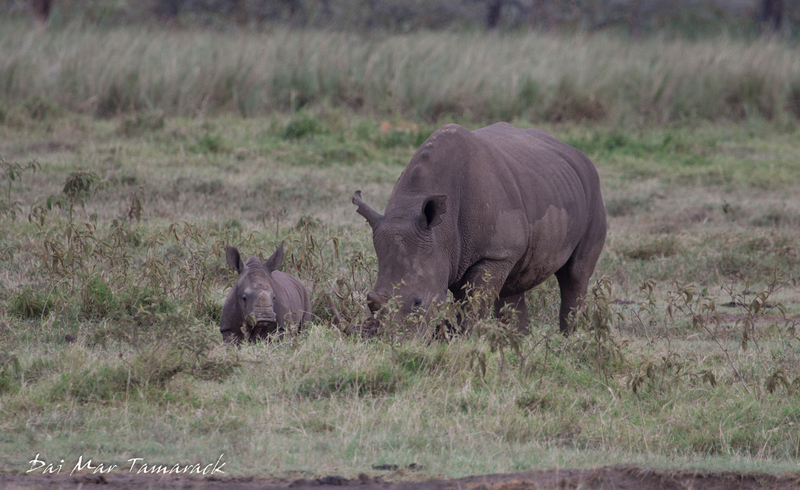 It was a mom and baby white rhino. 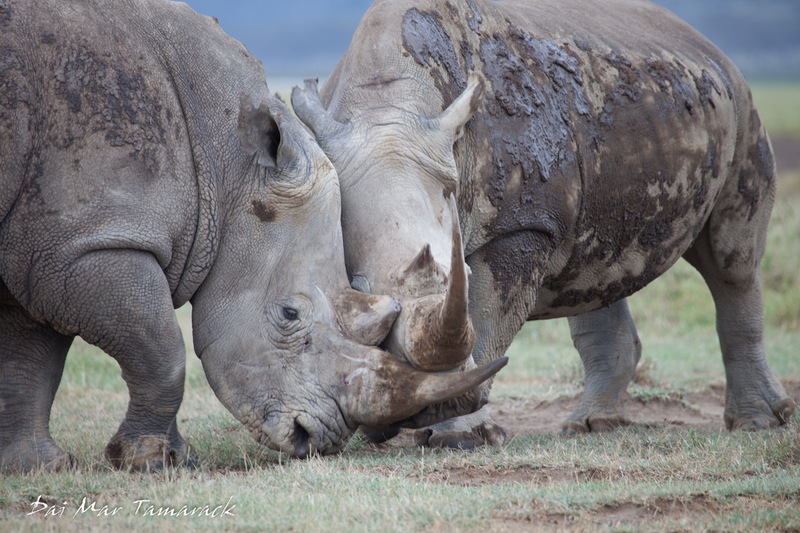 The big 5 was now complete, and the rhino sightings were just getting started. 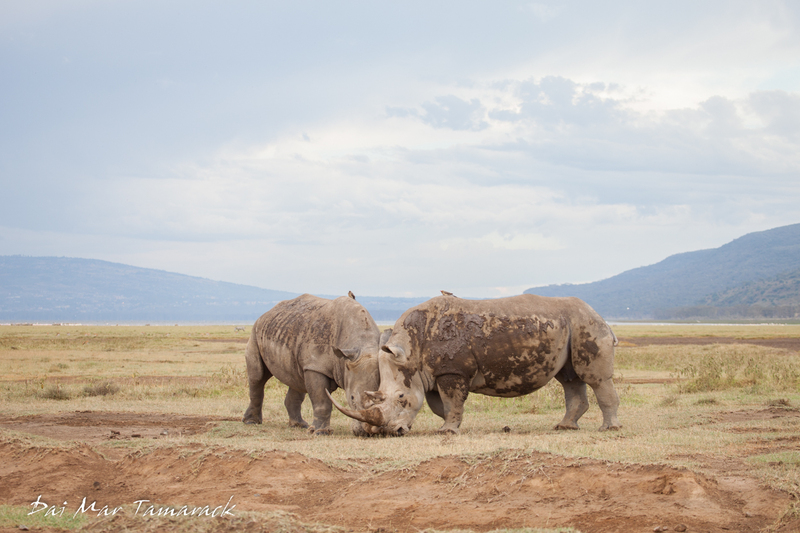 Next we came across five white rhinos in some kid of competition. They would lower their horns and push each other with their massive heads. I was a bit worried that a few eyes might get poked out by some of the bigger horns. 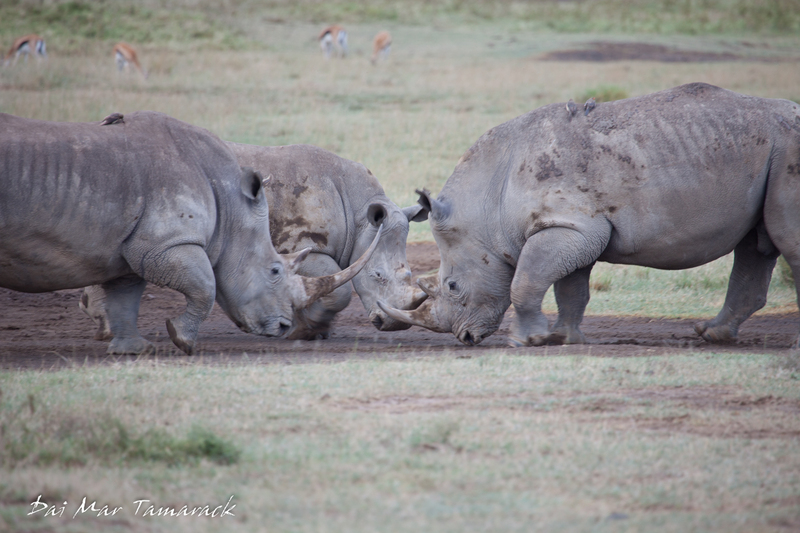 We watched these rhino battles until someone noticed an animal with a strange loping run further afield. 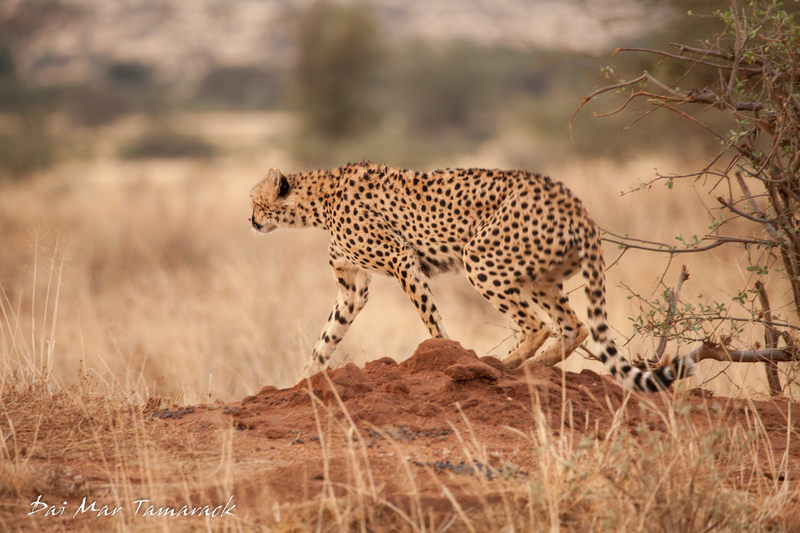 When we approached closer we realized that it was a spotted hyena. 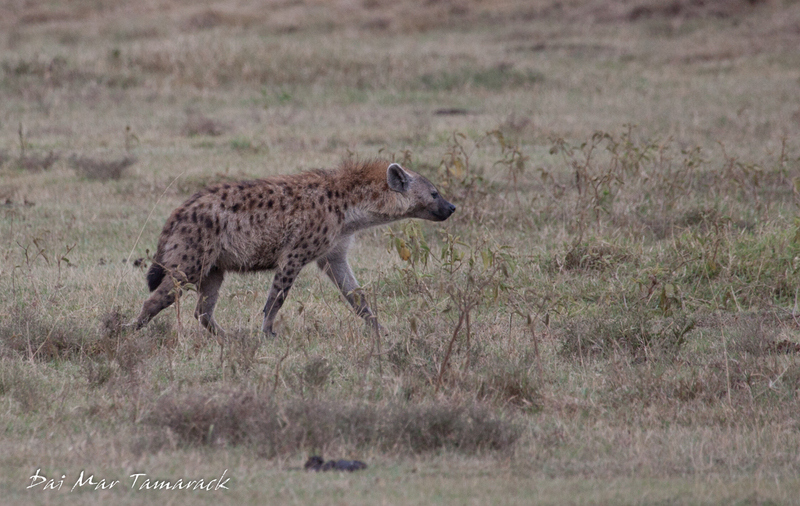 Things got even better when the hyena motioned behind and a second hyena appeared. The two then circled a lone warthog who we all thought acted pretty calm despite the current events. Just when it looked like the warthog was just going to let the hyenas have an easy meal it whirled on the closest sending it scampering back. The hyenas were a bit more cautious after this but the warthog stayed calm and collected. With big tusk and a very thick hide there was good reason for this warthog to feel confident. In the end the hyena moved on in search of easier prey. With the sun getting lower we came across a traffic jam that could only mean a big animal sighting. It took us awhile to find the culprit. We hear someone say 'lion', but despite our scanning in the tall grass we couldn't find it. It wasn't until someone looked up that we saw it. A tree climbing lion! This is a pretty rare sight. It stayed pretty far away but we were able to snap some photos and get a good look through the binoculars. It did give chase to some impalas but to no avail. We must have passed 100 baboons and 200 buffalo milling about in the forest on our way back. At this point our memory cards were full and the bottle of whiskey was empty which were both signs of another good day in Africa. Remember you can easily find all the posts from this particular safari by entering 'Kenya2018' into the search bar on this site. 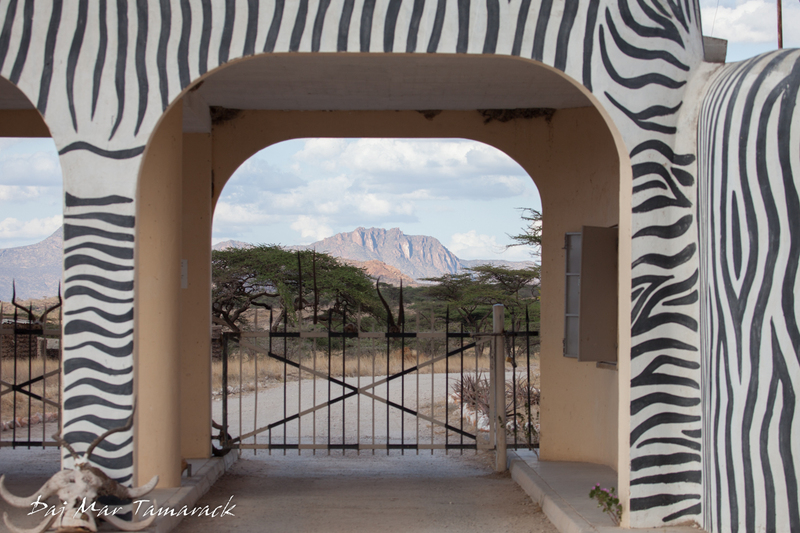 We left Samburu after an early breakfast knowing that we had a long day of driving ahead of us. 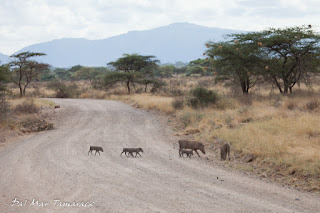 We did take advantage on our drive out to stop for some more animal encounters, and luckily the roads around this part of Kenya have really improved over the last couple of years. I wanted to break up the drive a bit so I had planned some fun and educational stops along the way. Our first stop was at the equator. We crossed from the Northern hemisphere to the Southern hemisphere in a town called Nanyuki. If you are wondering what the light blue water pitcher is doing in the picture above then you are about to find out, just like the group. A local gentleman came over to the group and offered to do a little demonstration. He asked if we had heard about the toilets flushing in different directions once you cross the equator. He told us to watch closely as we walked from one side of the equator to the other. He pored water into a small bowl with a tiny hole in the bottom. As the water drained out he dropped a match into the water and sure enough it spun counterclockwise north of the equator and clockwise when we walked south. The real kicker was when he did it again, below the sign, on the equator and the match didn't spin at all. Next stop was a bit of a tourist trap but still a wonderful sight, Thomsons Falls. We paid $2 each to walk out to a platform overlooking the falls. There is a massive development adjacent to the falls and there are quite a few touts trying to get you to spend money but the view is pretty breathtaking. Several locals dressed in traditional west African dance regalia latched onto Erica and David, while Chris tried is best to fend off a chameleon that had been thrown onto his shirt and was starting to crawl up towards his head. Our final stop before our destination of Lake Nakuru National Park was at the rim of the Great Rift Valley. This incredible geological feature stretches for over 3,000 miles. It is where two massive tectonic plates are spreading apart. Earlier this year a brand new crack opened up down in the valley. We drove right across the crack which had opened right through the middle of some farms. Many of the famous early human fossils have been found in the rift valley. Several soda lakes and many volcanoes are found in the rift valley. After taking a good look from the escarpment we jumped back into the car to wind our way down to the floor of the rift valley and to one of the most famous soda lakes, Lake Nakuru. In Samburu we stayed inside the park at a lodge called Sentrim Samburu Lodge. As is the custom here in Africa we were met with a hot, wet towel to and a cool fruit juice as we arrive to refresh ourselves after the long ride. My sister and I stayed here once before and as I remembered it was rustic and quiet. The generator came on in the morning and in the evenings so you could charge up you devices, but during the night it was just the noises of the surrounding wildlife and nature. Everyone had standalone bungalows with ensuite bathrooms, mosquito nets draped over the beds, and a hammock on the front porch. Our first night here we had the entire place to ourselves, which meant very attentive service at dinner. For example as I brought the last morsel of food to my mouth my plate would be swept away by our waiter out from under me. 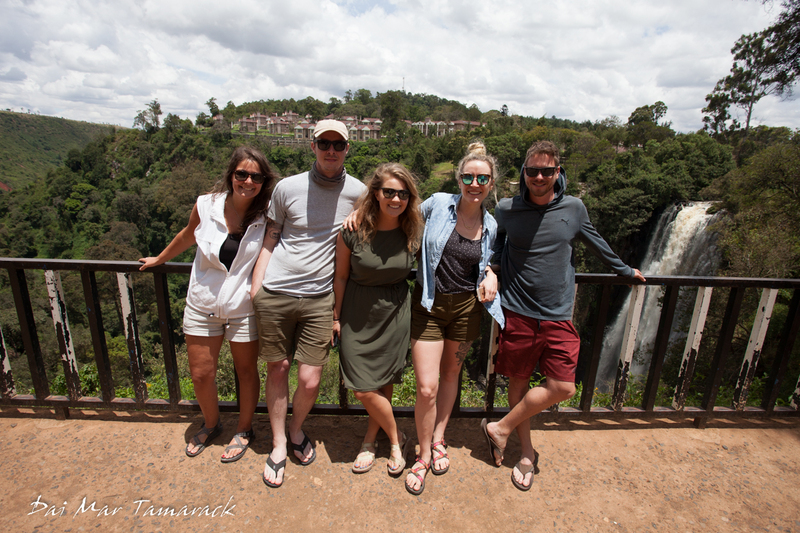 The staff was incredibly nice, as they have been at all of our lodges. Richard was our go-to guy here this time and we even ended up giving him a ride into town on our last morning. Samburu tribe...another can't miss opportunity when you come on safari with me. We had beautiful bird sightings, like this little bee-eater pictured on the left. We also saw some carnage from an unlikely source. 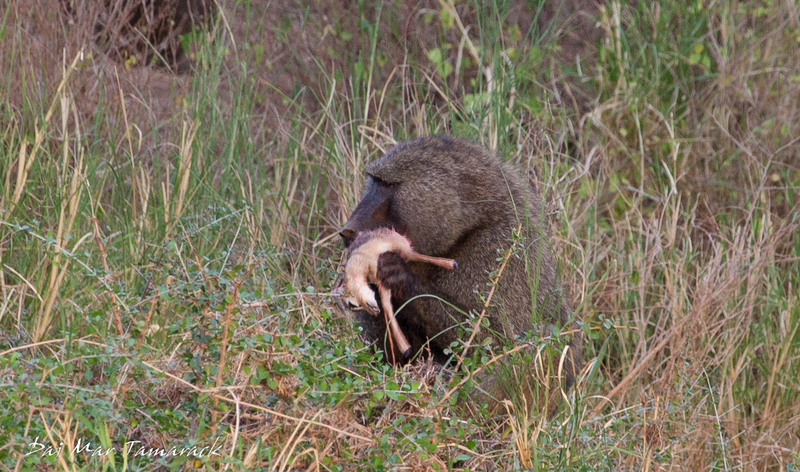 We notice a huge male baboon down near a stream eating what first looked like a bright red fruit. I thought it may be the fruit from some cactus (its very desert-like here.) After Becca and David busted out their powerful binoculars (a must have for any African safari), they informed me that it was eating some kind of animal. 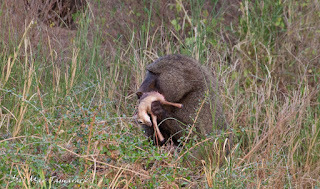 I knew baboons were omnivores, so they eat both veggies and meat, but this was a first for me to see. Once the prey shifted into sight David exclaimed, "It's eating a dik-dik!" Sure enough when I zoomed in on the picture above you could see the front half of what remained of the little antelope. The circle of life continues here in this eat or get eaten world. 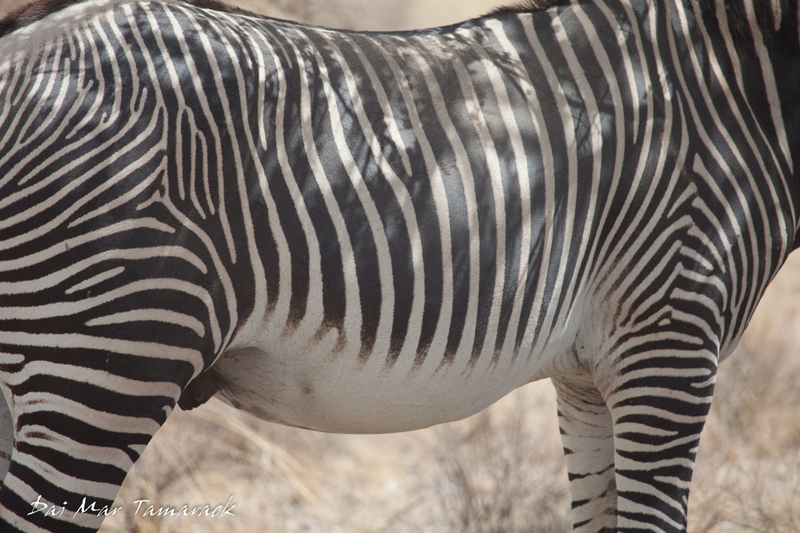 As the sun was getting low on our last game drive in Samburu we came across one of my favorite animals. In fact, it was five of my favorite animals! 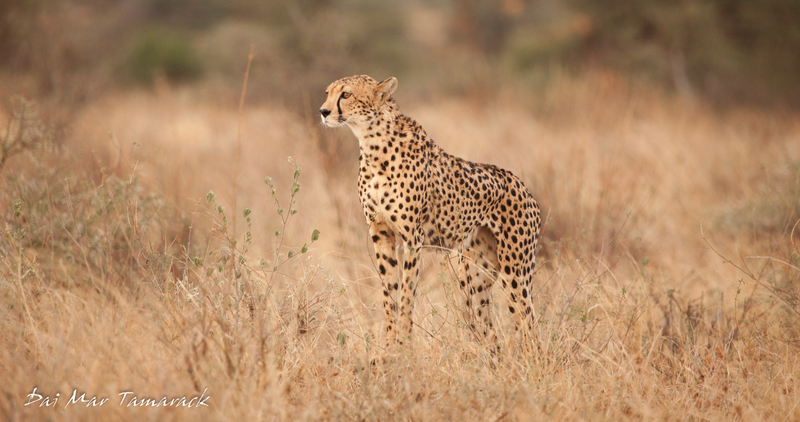 A mother cheetah with her four yearling cubs were perched on a termite mound near the road, eyeing the plains below. 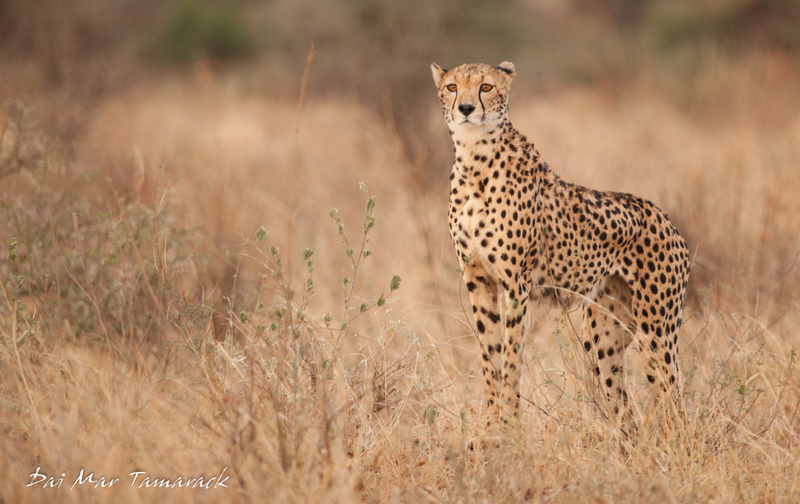 We could tell that she was looking for possible prey and crossed our fingers that she would spot something soon, as you are not allowed to drive around these parks after sunset as a general rule. The cubs followed their mom's lead, looking down the hill for movement. The must not have seen anything too interesting because they sauntered around looking pretty relaxed. While we didn't get to see the fastest land animal in the world live up to its name, any encounter with this incredibly endangered big cat is always top of my list. And as Erica pointed out, with these babies the threatened population is hopefully continuing to rise. In fact I had never seen cheetah in this park before so this was a great sign. 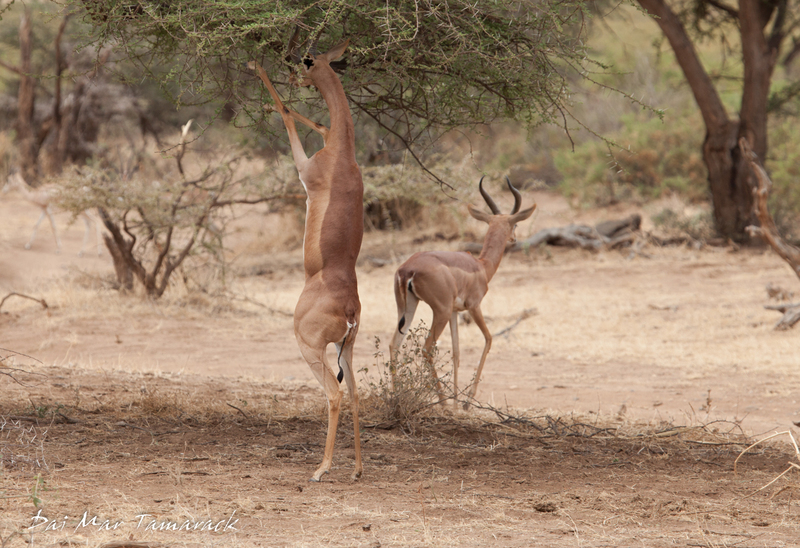 It was a great way to end our final game drive in Samburu. We stayed with the cheetah family until the last possible second. Then our driver James finally had to pull us away as we bolted back to Sentrim Camp to get there before too late. 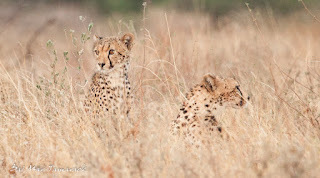 Over the past six days we have seen lions in Tsavo East, drank tuskers while watching big tuskers jostle at the watering hole in Tsavo West, laughed at the antics of sleepy cheetah in Amboseli, walked with zebra and dung beetles in the Swara Plains, and fed colobus monkeys in the Aberdare Mountains. And those are just a sample of the highlights. It also brings us to the midpoint of our safari. Which means we still have a lot left to see and experience! 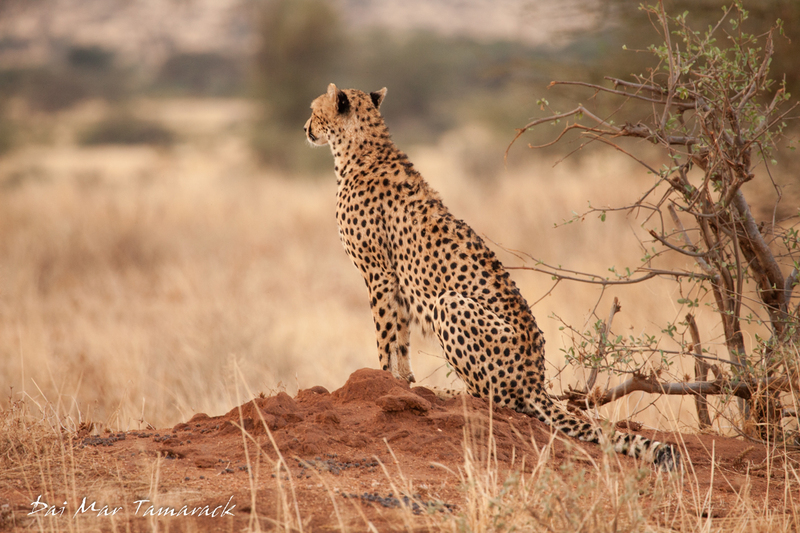 Next on the list is our northernmost park, Samburu National Reserve. 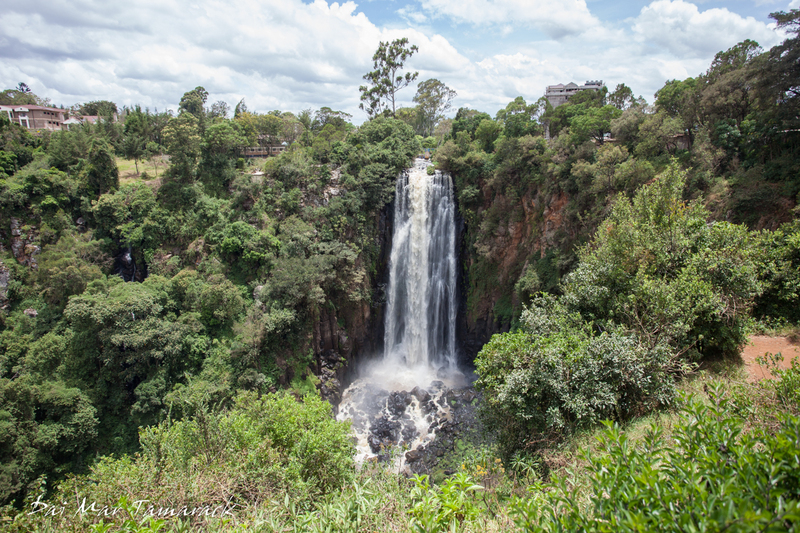 This park is split into two by the Ewaso Nyiro river. 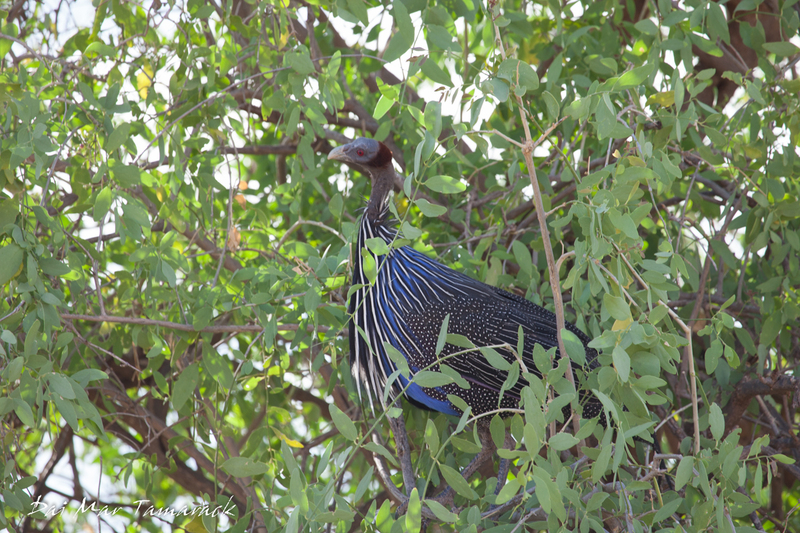 The ecosystem here in Samburu is very different than what we just experienced in Aberdare. 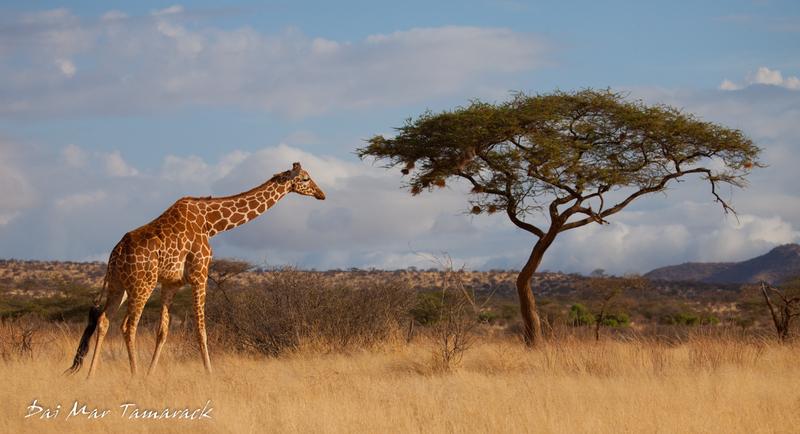 We've traded lush waterfalls and dense foliage for arid plains, golden grass, and acacia trees of the African savanna. This ecosystem is the southern extent of some animals range, which gives us the opportunity to encounter some different species. Collectively known as the Samburu 5 these animals include the reticulated giraffe, the grevy zebra, the geranuk (or giraffelope), the beisa oryx, and the somali ostrich. The park also boats big cats, elephants, and a host of other fun creatures to try and look for. 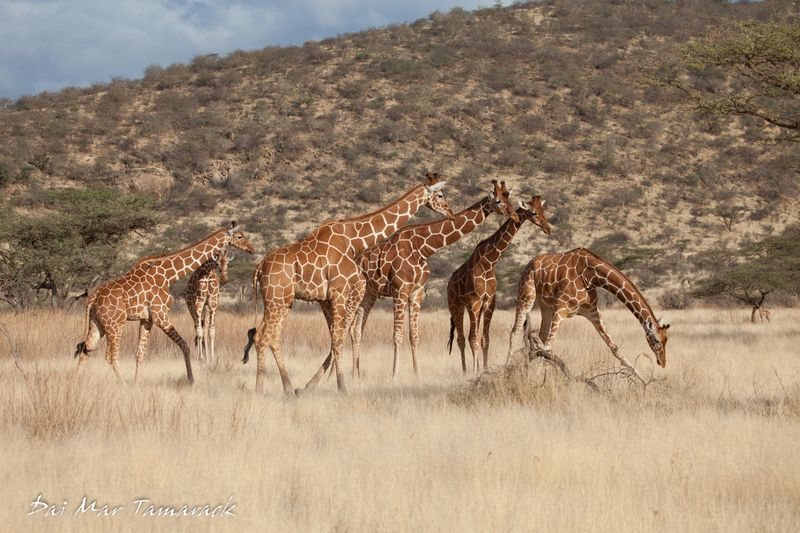 This trip to Samburu seemed to be the during the year of the giraffe. 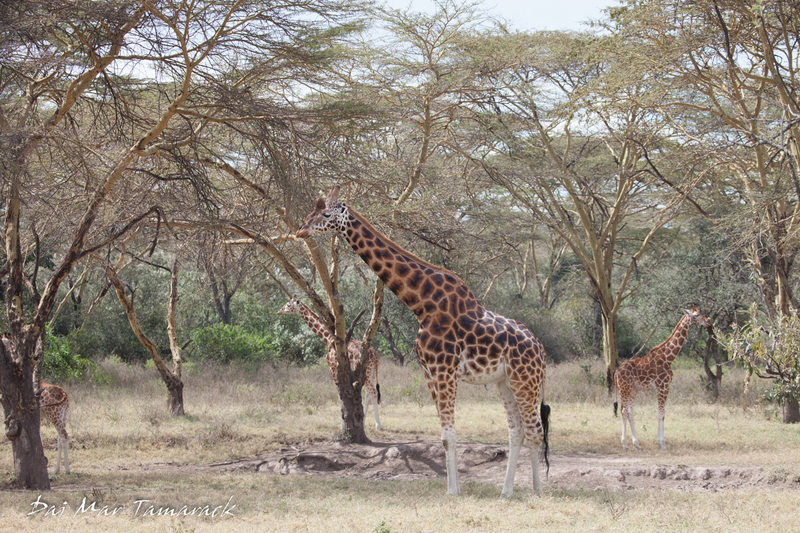 We had so many wonderful encounters with these tall, lumbering animals here. 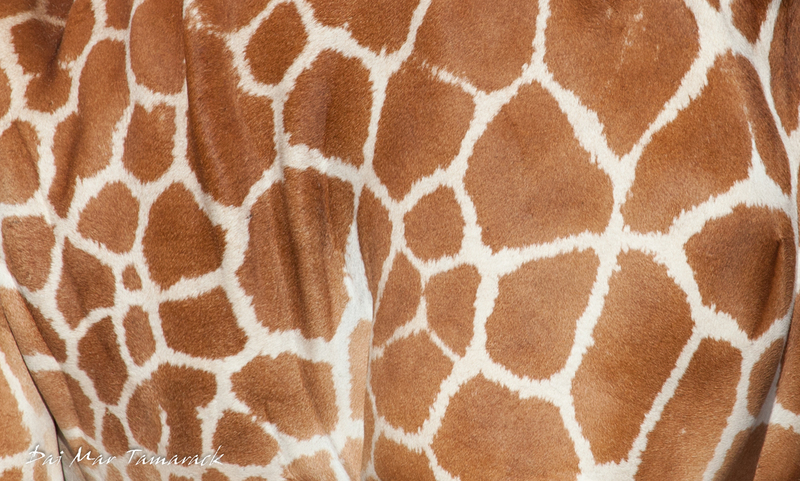 Everyone agreed that the beautiful patterns on this subspecies of giraffe was the most beautiful of them all. It seemed like bigger groups of giraffes were hanging out here than what we saw at other parks. A group of moving giraffes is called a journey, while a group of stationary giraffes is called a tower. The group really got into this nomenclature and used it often for the rest of the trip. 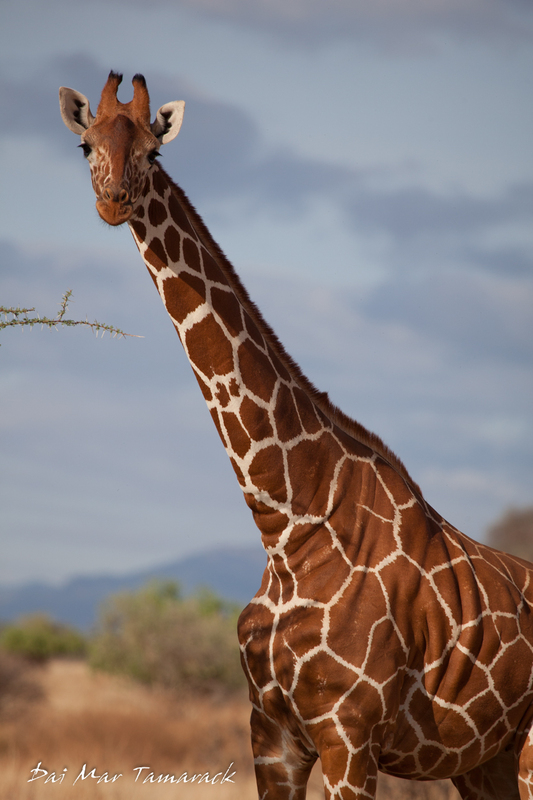 Samburu is now the new location of the biggest journey of giraffes I have ever seen...19! 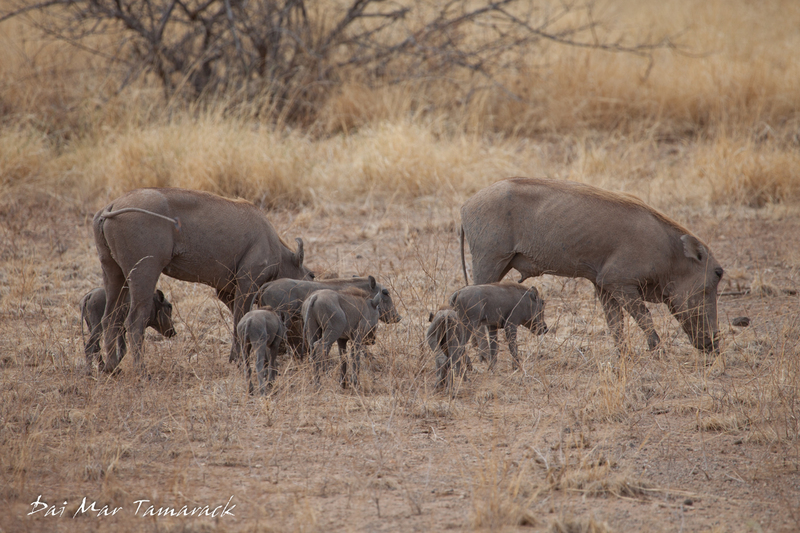 The warthogs continued to be a very popular sighting with this group. I thought Erica couldn't be any more excited about them, until we saw an entire family with tiny babies. 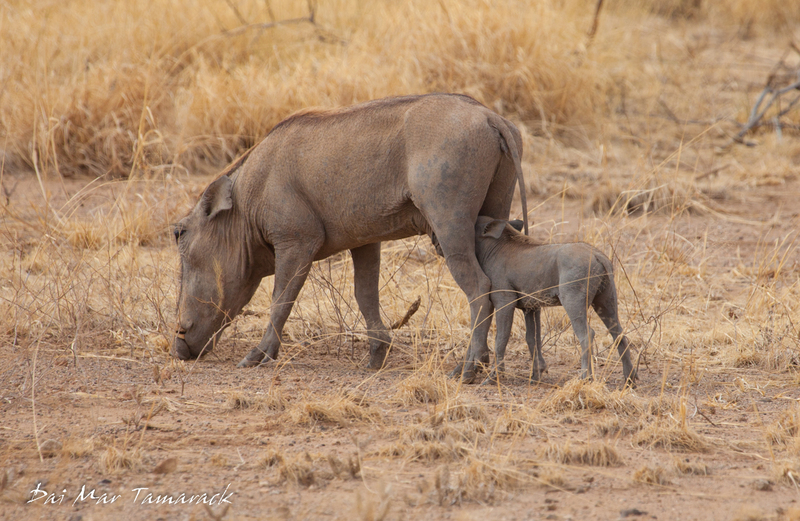 I thought this was going to bring her to tears, especially when one of the little baby warthogs ran underneath its mom and started nursing. 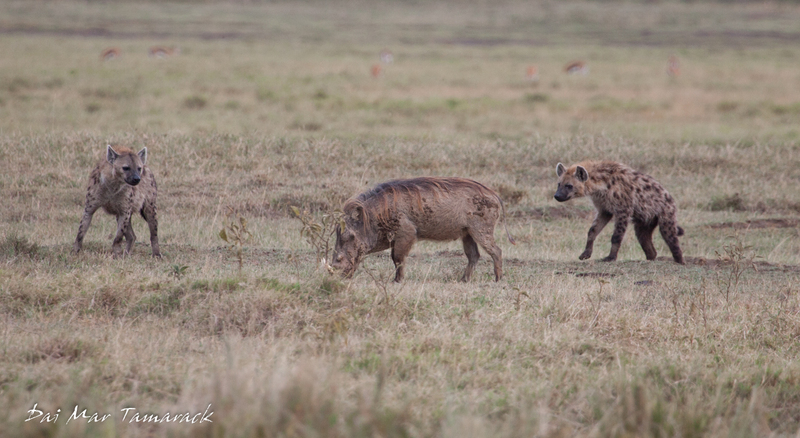 When something startled the warthogs they all would run off in a line with their wiry tails sticking straight up. 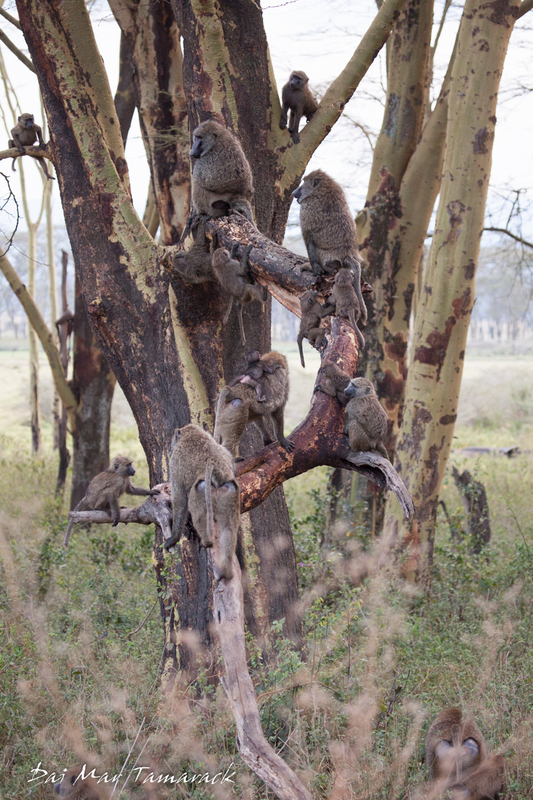 We ended up getting four of the Samburu five. The Somali ostrich eluded us. But I always say its good to leave something for next time. 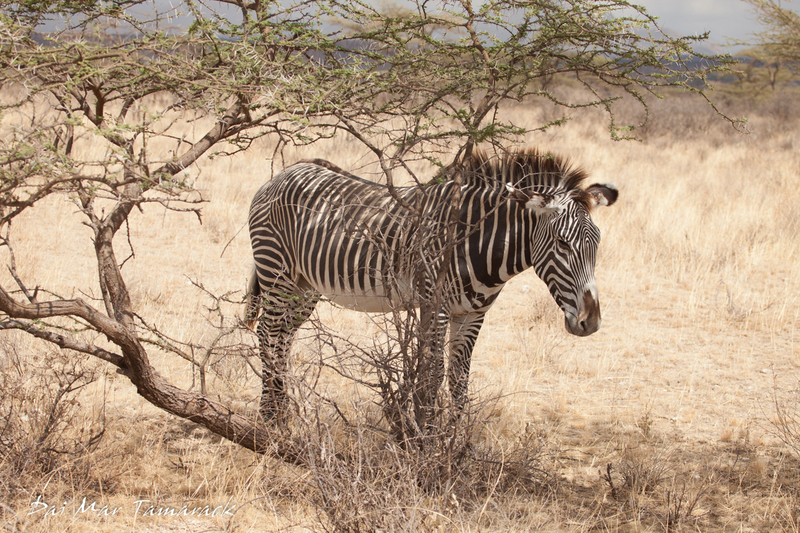 I was very excited that we encountered the grevy zebra, as it is by far the rarest of them all. This is the species that I grew up with on an island the Bronx Zoo used as place to breed endangered animals. They are quite striking with their all white underbellies and narrow dark black stripes. 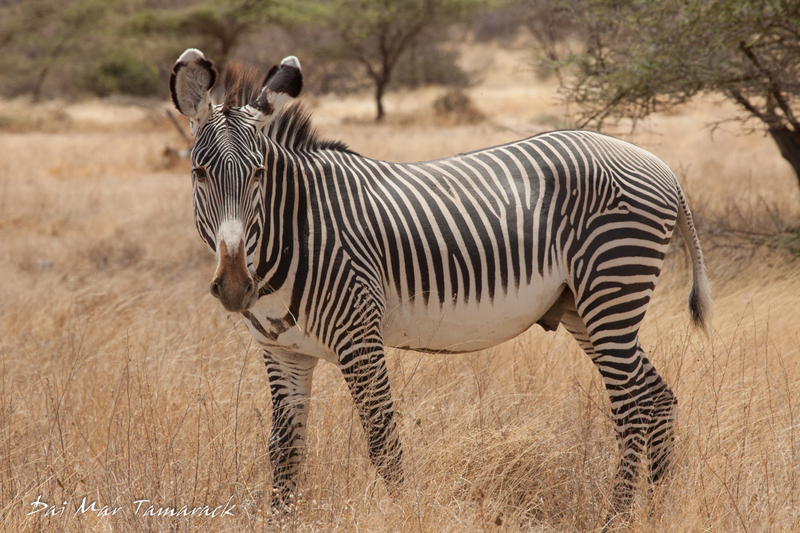 At this point in the trip everyone in the group could immediately recognize something different about the way these zebras looked compared to the many plains zebras we had been encountering up till now.